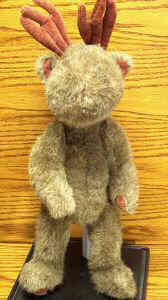 issued in 1991 and retired in 1997; 17" Moose; issued in 1991 and retired in 1997. Beatrice has jointed arms and legs, and a navy boyds tag sewn into her left leg. The paper tag is missing. This mo..